"Your book is terrific. It not only answers my questions, but also provides an action path to any potential investor wanting to go the route of Preferred Stocks investing." - MKY. Welcome to all of the new CDx3 Newsletter readers who signed up during October. This is your first issue of the CDx3 Newsletter, a free monthly newsletter devoted to the interests of CDx3 Preferred Stock investors. I have extended the availability of the "Quick Guide To Preferred Stock Investing During A Global Credit Crisis." The feedback from those of you who have already read this 4-page Quick Guide has been huge and very positive so I wanted to continue to make this important document available to readers. "Quick Guide To Preferred Stock Investing During A Global Credit Crisis"
If you choose to let this historic opportunity go by, do so because you feel that it is in your best interest, not because you are uncertain about how to take advantage of it. This is a new report. Please download and read your free copy (PDF, download now). You'll be very glad you did. Thank you for your interest in my preferred stock research. On October 7, 2008 the U.S. Treasury announced that it was going to be investing $250 billion in custom-made preferred stocks issued by "healthy institutions" - a select few banks that could meet the Treasury's stringent criteria. The regulator is about to invest billions in the very banks that they regulate. The Treasury is no different from any other investor - they want to be sure that they get their billions back. The banks that can make it into this Treasury program are now essentially protected for the next several years. In the Last Month's CDx3 Investor Results article I will identify The Protect Six initial banks that are issuers of CDx3 Preferred Stock. Just after last month's announcement of group subscriptions to the CDx3 Notification Service, I had the pleasure of speaking at the monthly meeting of the Are We Rich Yet (AWRY) investment group. The Special Announcement article summarizes our meeting and explains how just two people can form a group when purchasing a group subscription to the CDx3 Notification Service (what's this?). The CDx3 Company Spotlight article describes The Protected Six initial banks that were the first to be admitted to the U.S. Treasury's $250 billion preferred stock purchase program - all but one of which were founded in the 1800's. Remarkably, and as required by the CDx3 Selection Criteria (Preferred Stock Investing, Chapter 1) The Protected Six initial banks have never missed a preferred stock dividend payment. This month's CDx3 Question Of The Month article describes how well the CDx3 Income Engine has performed for CDx3 Investors during this 15-month credit crisis. The CDx3 Selection Criteria has filtered out every one of the failed banks - IndyMac, Lehman, Freddie, Fannie, Washington Mutual, Bear Stearns, New Century - and CDx3 Investors have not so much as missed a single dividend payment - ever. How many investment methods can make that claim? The Free Special Offer article below provides you with a download link to what could be the most important document you will read during this global credit crisis. As a reader of this monthly CDx3 Newsletter, you obviously have an interest in preferred stock investing. This newly published report is titled "Quick Guide To Preferred Stock Investing During A Global Credit Crisis" and is available to my readers for free (see link in the Free Special Offer article below). The market prices of the CDx3 Preferred Stocks issued by The Protected Six initial banks soared as soon as the U.S. Treasury identified them on October 7, with some jumping up over 20%. Banks that the Treasury is going to be investing in through this program are essentially protected for the next several years. The second wave of banks that the Treasury is going let inside their castle is going to be announced during November. I will report back to you in next month's issue of the CDx3 Newsletter. Out of 8,500 banks, the U.S. Treasury has essentially protected nine "healthy institutions" for the next several years, six of which are issuers of CDx3 Preferred Stocks*. For those looking to ride the recovery wave in banks, let me explain how these "Protected Six" initial banks may be just what you are looking for. "These healthy institutions have voluntarily agreed to participate on the same terms that will be available to small and medium-sized banks and thrifts across the nation." A second group of qualifying banks is going to be announced later this month. Be careful here. Only a small percentage of the preferred stocks issued by these banks meet the ten CDx3 Selection Criteria*. Specifically, The Protected Six initial banks have a total of twelve CDx3 Preferred Stocks* that are currently trading. Prices Going Up: This chart shows you the percent increase in the market price of these twelve CDx3 Preferred Stocks once the first wave of banks was identified by the Treasury on October 7, 2008. Between October 6, the day before the Treasury program was announced, and October 31, 2008 the market prices for these twelve CDx3 Preferred Stocks jumped an average of 10.26%. Specifically, the average market price increased from $17.37 per share to $19.10 - in three weeks. Two specific issues jumping more than $3 per share. Subscribers to the CDx3 Notification Service received an email message identifying the trading symbols of these twelve CDx3 Preferred Stocks from The Protected Six initial wave of banks. Additional banks have until November 14, 2008 to get into the second wave of the Treasury program. After the Treasury applies their criteria and we wash them through the CDx3 Selection Criteria, only some of these additional banks are going to make the grade and only some of their preferred stocks will survive all of that filtering. Once the resulting CDx3 Preferred Stocks are identified, subscribers to the CDx3 Notification Service will receive another email notice that identifies the trading symbols and other important information about each qualifying preferred stock issue. 9.6% Still Available: But don't think that you're too late, even for these initial six banks. The average annual dividend yield of these initial twelve CDx3 Preferred Stocks, even after the big October run up in their market prices, is still a very-easy-to-warm-up-to 9.6%. Healthy Institutions: The Treasury knows as well as anyone else that investors have been nervous about investing in banks. That's exactly why their new preferred stock purchase program is designed the way it is, including the public identification of the participants. In two waves, they are shining a big bright light on specific banks and in so many words declaring them "healthy institutions" in order to sooth investor nerves. Not to mention investing $250 billion in them. 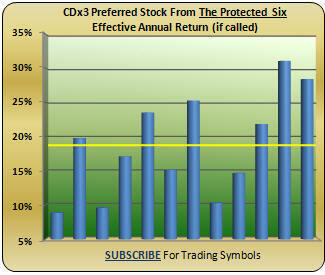 18.78% Effective Annual Return: All CDx3 Preferred Stocks have a five year lifespan. Five years after introduction the issuing company regains the right to purchase your shares back from you at $25.00 per share, regardless of what you originally paid (this is referred to as a "call"). The average market price of these twelve CDx3 Preferred Stocks on October 31 was $19.10. If called, that means an average capital gain of $5.90 per share on top of the average 9.6% dividend income that you'll be making in the meantime. That computes to an average effective annual return of 18.78% (in the event of a call) from the twelve CDx3 Preferred Stocks issued by The Protected Six initial banks - with more on the way on November 14. The data that I am presenting here are intended to illustrate how The Market (you and me) is reacting to the Treasury's preferred stock purchase program and the implied protections that come with it for banks that can meet the criteria. If the U.S. government ever wants to see their billions again, the banks that are able to meet this program's stringent criteria must not be allowed to fail for the next several years. Perfect Track Record: The CDx3 Selection Criteria have successfully filtered out every financial institution that has failed during this credit crisis. CDx3 Investors knew to stay away from Washington Mutual, IndyMac, Freddie Mac, Fannie Mae, Bear Stearns, New Century and Lehman Brothers from the beginning. Those who invest in CDx3 Preferred Stocks haven’t missed a single dividend - ever. Might there be exceptions down the road, especially during this historic credit crisis? Sure. But, to date, there has not been. How many investment methods can make that claim? If you've been looking for a way to ride the bank recovery wave, be sure to consider CDx3 Preferred Stocks issued by the banks that are falling under the implicit protection of the U.S. Treasury. This is a historic opportunity for preferred stock investors and one that is not likely to be repeated again within our lifetime. Preferred Stock Investing provides readers with the resources that they need to identify the trading symbols of these specific CDx3 Preferred Stocks. Or you can let us do the work for you by subscribing to the CDx3 Notification Service. * CDx3 Preferred Stocks: CDx3 Investors are only interested in the highest quality preferred stocks and there are lots of pretenders to weed out. Applying the CDx3 Selection Criteria (Preferred Stock Investing, Chapter 1) will eliminate about 90% of the regular preferred stocks trading on today's stock market. For example, here are three of the ten CDx3 Selection Criteria that regular preferred stocks must meet to be considered "CDx3 Preferred Stocks:"
3. be rated "investment grade" by Moodys Investors Service. Last month I had the pleasure of speaking to the Are We Rich Yet (AWRY) investment group in the heart of Northern California's wine country. The comfortable yet elegant Syrah restaurant played host on an 80 degree day to our discussion of my research regarding preferred stock investing and the CDx3 Income Engine. When I speak with groups I usually do so in some sort of auditorium using a microphone. But the smaller AWRY group venue allowed us to have more two-way discussion - a real treat for me. Most of the AWRY members had read the Quick Guide To Preferred Stock Investing During A Global Credit Crisis (download free) so the discussion was timely and informative. We started with an overview of the three objectives of my research: (1) maximize revenue while (2) minimizing risk and (3) work, and wrapped it up with a dissection of the credit crisis, the U.S. Treasury's new preferred stock purchase program and The Protected Six banks. The timing of my meeting with the AWRY group was particularly beneficial since group subscriptions to the CDx3 Notification Service were announced in last month's CDx3 Newsletter (see article). If you belong to a group, or want to form a group, and are interested in preferred stock investing, the group subscription to the CDx3 Notification Service is a huge money saver. $240 for a 4-Member Pack means that you save money with a group of two or more members (more info). Brokers, Financial Planners: Have clients interested in preferred stocks (fixed-income investors)? We do all of the research and work, you just forward the professional quality CDx3 email materials to them; add your own comments if you wish. Expand your relationship with your clients. Investment Groups: Tired of reviewing the same old reports at your monthly investment group meeting? Why not learn something new? Why now learn about how to select, buy and sell the highest quality preferred stocks? 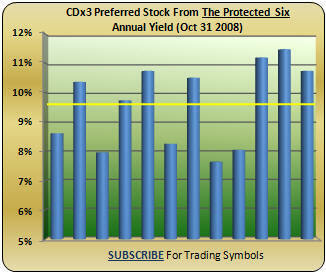 Make CDx3 Preferred Stocks part of your group's portfolio. Family membership: If there is even one other person in your family interested in investing, you're a group! Do something new and different and do it together! Already a subscriber? All you need to do is get a few friends together and have them split the cost of a 4-Member Pack. Everybody saves! Thank you once again to the AWRY investment group for your interest in the CDx3 Income Engine. One of the ten CDx3 Selection Criteria (Preferred Stock Investing, Chapter 1) is that the issuing company must have a perfect track record of never having suspended a dividend payment on a preferred stock. When you look at the dates that The Protected Six initial banks were founded, their accomplishment of a perfect track record is truly astounding. Founded in 1874, BofA is a $192 billion bank head-quartered in Charlotte, North Carolina. Founded in 1812, Citigroup manages its $74 billion global business from New York City. Founded in 1823, JP Morgan Chase is a $153 billion company and probably the single largest beneficiary of this credit crisis being the proud new owner of what use to be Bear Sterns and Washington Mutual. Also headquartered in New York City and founded in 1820, Merrill Lynch's $30 billion business will be folded into its new parent, Bank of America, in January 2009. No stranger to adverse market conditions, Morgan Stanley was founded in 1935 in the wake of the Great Depression and has built its business into a $19 billion financial powerhouse. Headquartered in San Francisco, Wells Fargo was founded in 1852 as a safe place to put California gold and is now valued at $111 billion (and has a really cool logo). The credit crisis delivered Wachovia Securities into Wells ownership. The Treasury will select the second wave of protected banks later this month. How do I get access to back issues of the free monthly newsletter? I'm specifically interested in how the system has performed over the past few months. - Carl J.
CDx3 Preferred Stock sales through June 2007 brought CDx3 Investors an effective annual return between 12-15 percent. You can see examples in past issues of the CDx3 Newsletter (click here to view the archive). Start with the oldest issue and just take a quick look at the headlines and tables in each Last Month’s CDx3 Investor Results article (first article in each issue). Since June 2007, dividend rates have been increasing and market prices falling (the Rule of Rate/Price Opposition, Preferred Stock Investing page 61), creating a very strong “buyer’s market” for CDx3 Preferred Stocks. 8.84% Dividend Income Now: Currently, the average dividend rate being paid by newly issued CDx3 Preferred Stocks is 8.84% so we have been buying, rather than selling (in order to calculate the return on an investment, per Carl's question, there has to be a sale). CDx3 Investors are purchasing these high-payers for market prices less than $25 per share, boosting yields even further (dividends are paid quarterly based on $25, regardless of your actual purchase price; so any purchase price below $25 boosts your actual return. Purchase prices for most CDx3 Preferred Stocks are currently $20-$22 per share). Once the credit crisis plays through, and these dividend rates start to come back down, the market prices for these high dividend payers that CDx3 Investors are buying now are expected to substantially increase. Look at it this way: say you were to purchase a CDx3 Preferred Stock today that pays an 8.5% dividend for $23 per share. A year from now, if new issues are coming out at 7% for $25 per share, what do you think is going to happen to the market price of your 8.5%-er? As rates come back down, the market prices of previous high payers will tend to increase (Preferred Stock Investing, page 61). That’s when you look to sell (using the Target Sell Price as a guide, Preferred Stock Investing page 85). My point is that, since June 2007 CDx3 Investors have been buying, not selling ; selling will come later. In the mean time, we’re making great fixed dividend income. If you’d like to know how buyer's of CDx3 Preferred Stocks are taking advantage of the current credit crisis conditions, there is an article in the April 2008 issue of the CDx3 Newsletter (see article) that explains when the best time to make a purchase is most likely to occur and why. If you have the book Preferred Stock Investing, you can receive a more detailed step-by-step explanation by following the Special Note on the top of page 124 to receive your free update to the book. The update includes an expanded description of purchasing CDx3 Preferred Stocks during this credit crisis. 15+% Later: Using the method described there to purchase CDx3 Preferred Stocks, the average effective annual rates, if called, for the last several months are: July, 15.3%; August, 21.3%; September, 19.9%; October, 15.9% (source: CDx3 Research Notes). So, in answer to your question, 12-15% until June 2007; since then we’ve been buying the highest dividend paying CDx3 Preferred Stocks that we’ve seen in years for bargain basement prices and are looking forward to selling them for a nice capital gain once rates come back down (and market prices for them go up accordingly). In the mean time, we’re making 8% to 11% in dividend income. Subscribers to the CDx3 Notification Service receive an email message whenever there is a buying or selling opportunity for the highest quality preferred stock issues - CDx3 Preferred Stocks. Please do not let this historic opportunity pass you by. Thanks to Carl J. for the great question. You will receive a free copy of the CDx3 Special Report "Dividend Accounting." Free Copy Of "Preferred Stock Investing During A Global Credit Crisis"
Many CDx3 Newsletter readers have been with me for quite some time. And from the email that I receive I know that many of you have read Preferred Stock Investing and have implemented the CDx3 Income Engine on your own (the book includes all of the resources needed to do so without the CDx3 Notification Service). The 15-month long credit crisis has shaken our financial system and everyone who is invested in it (which is just about everyone). Even though the CDx3 Selection Criteria, day after day, have successfully filtered out every failed bank for over a year now, and even though there has not been so much as a missed dividend for those who have invested in CDx3 Preferred Stocks, there's still some anxiety. And that's what concerns me the most. As a researcher, I have an enormous volume of data regarding the market price behavior of CDx3 Preferred Stocks. I can not only explain this market price behavior but I have the data needed to support my observations. Chapter 9 of Preferred Stock Investing includes the investment results, using the CDx3 Income Engine, for every qualifying preferred stock issued since January 2001. Whether market prices are driven down by uncertainty related to war (2002) or by a global credit crisis (2007/08), the market prices of CDx3 Preferred Stocks behave in certain ways at certain times. To thank you for your interest, and to provide you with some very timely insights, I have just published a "Quick Guide To Preferred Stock Investing During A Global Credit Crisis" (PDF, download now). This is an important and timely document that all who are interest in using the highest quality preferred stocks to benefit from this credit crisis should read. Understanding the CDx3 Income Engine is more important now than ever. Enjoy reading the Quick Guide and thanks again for your interest in my preferred stock research. What Additional Banks Will The U.S. Government Essentially Protect For The Next Several Years? At the close of last month's CDx3 Newsletter I asked what the effect of the Treasury's Trouble Asset Relief Program (TARP) was going to be. The program is intended to put a trampoline under the financial system, but would banks bounce back or bust right through? As the Treasury has now rolled out the first phase of their program, we can say that, without a doubt, the effect on The Protected Six CDx3 banks has been extremely positive. 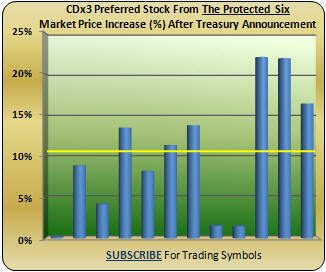 The market prices of the CDx3 Preferred Stocks issued by The Protected Six went through the roof as soon as the Treasury identified the CDx3 banks that were included in the initial rollout. Since the Treasury is investing tens of billions in these banks by purchasing custom-made preferred stocks from them, these specific banks are essentially protected for the next several years (at least until the Treasury gets their billions back). While the requirements for banks to participate are stiff (the government is only going to invest in banks that they know are going to be around), additional banks - the second wave - have until November 14, 2008 to try and move behind the protective walls of the U.S. Treasury's castle. The Treasury's preferred stock purchase program has created an enormous and historically unique opportunity for CDx3 Preferred Stock investors. You now know the identities of The Protected Six initial banks and the "Quick Guide To Preferred Stock Investing During A Global Credit Crisis" (download free, 4 pages) explains how to use the CDx3 Income Engine to take advantage of this unique opportunity. But who will the lucky banks be that the U.S. Treasury allows to join the program by November 14, 2008? I'll report back to you in next month's CDx3 Newsletter. Remember, I'm not a stock broker; I'm not trying to sell preferred stocks to you; and I don't sell investment advice. I'm an investment researcher with an economics and statistics background who has developed a simple way to earn a respectable return at very low risk. And I've written it down in Preferred Stock Investing. I'm hopeful that you find these monthly CDx3 Newsletters interesting, and will consider learning more by purchasing my book, Preferred Stock Investing or by subscribing to the CDx3 Notification Service. Please take a look at www.PreferredStockInvesting.com. And don't forget about my FREE SPECIAL OFFER. Know someone who might be interested in simple, low-risk investing for non-investment experts? Have them send an email message to CDx3Newsletter@PreferredStockInvesting.com and they will automatically begin receiving this monthly CDx3 Newsletter next month (plus a CDx3 Special Report) - all FREE.